A great painter, a great woman, a great story' Barry Humphries Margaret Olley is arguably Australia's most loved living artist. She's also one of the country's most generous benefactors to public art galleries. This intimate biography begins in the 1920s in the green, tropical wet of Tully, North Queensland, where Margaret's early childhood was spent on a cane farm and dairy. The story unfolds to tell of her life-long love affair with painting. At boarding school at Somerville House, Brisbane, Margaret found a mentor in art teacher Caroline Barker, and she went on to blossom as an art student at East Sydney Technical College. The book includes intriguing revelations about her friendships with well-known figures such as Donald Friend, William Dobel and Russell Drysdale, and the success of her first one-person show in Sydney at the age of twenty-five. Bohemian adventures in Europe with fellow Australian artists, including David Strachan, were to follow. She travelled - sketchbook in hand - around England, France, Italy and Spain; met Alice B. Toklas in Paris; and lived on a vineyard at Cassis in the South of France. Her story continued back in Australia where in the late 1950s in Brisbane Margaret struggled with alcoholism and was eventually forced to face up to drying out or drying up creatively. Once she'd given up her comforting nips, her return to life and painting was joyous. Now, despite a recent bout of personal darkness - her 'black hole' of a couple of years ago when not only did she want to give up painting but also living - and a walking frame, she is busily preoccupied producing art; providing more donations to our galleries; and entertaining the odd celebrity, like Barry Humphries or Maggie Smith, in her notoriously cluttered Paddington terrace. 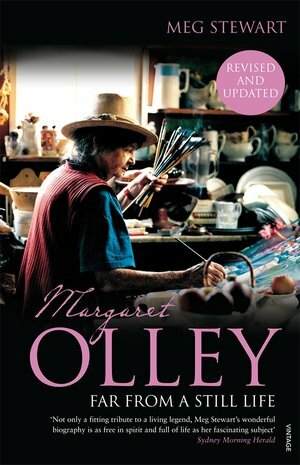 This is a rich and comprehensive look at eighty-odd years of Margaret Olley, her lovers and friends, and, of course, her painting.